Founded in May 2002, La Casa de Mi Padre, part of My Father’s House International, is an orphanage located in El Salvador. The home serves approximately 50 children. In 2005, the orphanage purchased a 28-acre farm in Santo Tomas that will provide a permanent location allowing them to provide healing and hope for up to 80 children. The complex will have eight children’s homes, an on-site school, counseling building, food storage building, missionary and staff housing, guest lodge, pavilion and playgrounds. Crowley employees volunteer their time and participate in fundraising and collection drives, while Crowley donates much-needed goods to the home, including a stove, breathalyzers and special education supplies. Through the years, employees have donated thousands of hours throughout the year and holidays. In addition, funding was donated to La Casa de mi Padre through a program spearheaded by El Salvador’s First Lady to buy gifts for underprivileged children. Each child at the orphanage also receives a gift on their birthday. Founded in 2002, Cabecitas de Algodon serves as a home to seniors with low financial means. The home houses approximately 33 elderly people. Crowley employees often volunteer their time to visit the seniors, participate in fundraising drives, organize activities and movie nights and donate gifts and food items. The volunteers also visit the center and provide haircuts and manicures on a regular basis. Approximately 104 children, teenagers and young adults call El Hogar Pajarito Azul their home. Established in 1994, the non-profit organization receives some governmental funding but truly relies on donations from private individuals and companies to provide education, rehabilitation, specialized care, employment preparation and recreation to abused and neglected children. Residents receive education in various vocational fields, including sewing and crafts workshop, printing and baking. Crowley employees volunteer their time by hosting celebrations throughout the year, visiting the home on a regular basis and participating in fundraising drives, while Crowley donates items like air extractors for the baking room, freezers, baking supplies, first aid kids, and other necessary items. Fundacion Amor y Vida is a non-profit organization that provides a safe and loving home to abandoned or orphaned children suffering from HIV/AIDS. Founded in 1994, the home provides medical care to children and is sustained by a group of volunteers. Currently, the home houses 36 children ages 3 to 18. The complex includes a building with bedrooms, administrative offices, laundry area, church, classrooms and a new printing building. Crowley’s Charity Team in Honduras has enthusiastically supported this project since 2006 by organizing field trips and crafts, helping with handy repairs and maintenance and hosting educational days and celebrations throughout the year. Employees also worked together to build a library and computer lab for the young residents. Crowley has donated computers, microwaves, a dining room set, a lawnmower and apparel for the children, including pajamas. Employees organized a Christmas party for students at the Centro de Educacion Basica Cristobal Colon, an elementary school. Crowley has donated items such as furniture, utensils, first aid supplies, a stove, microwave oven and a freezer to the school. Crowley employees also volunteer their time and participate in events and celebrations throughout the year, including a holiday celebration where approximately 80 children received gifts, participated in group games and got to meet Santa Claus. Crowley employees have made dozens of visits to the Escuela de Guarai de Heredia, an elementary school with 1,300 children between the ages of 7 and 14. Volunteers have donated their time at the school, which is located in an urban, crime-ridden area, installing a new lunch room and working on a restoration project for second and third grade classrooms. Crowley employees also built a playground at the school. Founded in 1988, Hermanas de Jesus El Buen Samaritano is a non-profit organization that provides a long-term home to orphaned and abandoned children with Down syndrome, hydrocephaly and other neurological conditions. The home, run by a group of Catholic nuns, relies heavily on donations. Crowley volunteers have made a difference by volunteering their time; fundraising and donating food, clothing, cleaning products, a stove, a refrigerator, a washer and dryer set, cribs, mattresses, fire extinguishers and other safety items and bed covers. Team members also volunteer their time regularly to handle improvements like painting fences, doing yard work, installing an entrance gate and repairing other items. In 1996, Crowley employees in Puerto Rico founded COPROFEM, a non-profit organization, to raise funds for a little girl Elizabeth Merced, who suffered from serious health issues. Employees donated money directly debited from their paychecks to help with medical expenses. The employee organization also worked with the Make-A-Wish foundation to send Elizabeth and her parents to Disney World. Today, more than a decade after Elizabeth passed away, Crowley employees continue to financially support children by partnering with the Spina Bifida & Hydrocephaly Association of Puerto Rico. Founded in 2005, Casa de la Divina Gracia serves as a shelter for at-risk girls who have been abandoned and/or have been victims of abuse. The home houses about 24 girls, providing them will all their needs including clothing, food and education. 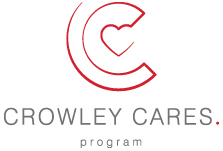 Since getting involved, the Crowley Cares team has donated computers, school supplies, clothes and several other items the girls in the home need. Employees in Panama have also been active in creating fundraising events in the office, and several of them participate in the organization’s mentoring program, volunteering their time to visit the girls, helping them with homework and acting as positive role models and friends to them. Posadas de Belen is an organization focused on helping pregnant teenagers and mothers-to-be in need of shelter, food, and an education. During their stay, these young moms are taught the necessary skills to take care of themselves and their children. Crowley Cares and employees in Costa Rica recently got involved with this organization, donating diapers and other essential items for these young moms in need. Some of the employees have also started fundraising events throughout the office to raise more money for supplies. They’ve also volunteered their time to spend quality time with the teens and their children.